A winged medusa. Not a bad looking model. These new Dark Elves are going to be hard to resist. I can buy a rubber snake and a doll for a lot cheaper than $75 USD and use my hot glue gun. Lucky I have a dark elf army from 1967 that I can use, not need to buy overly expensive GW! But I wouldn't use them because they reduced the range of repeating crossbows to 12". My local store has never ever sold any Age of Sigmar models, nobody buys AoS, GW is definitely going out of business. Oldhammer will never go out of business, lol. 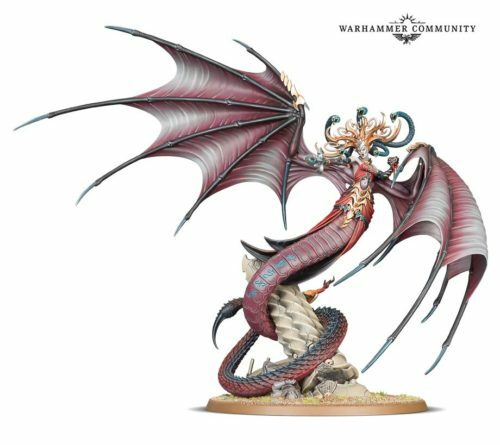 It's not a faction that I have a personal interest in buying, but man those models looks NICE!!! 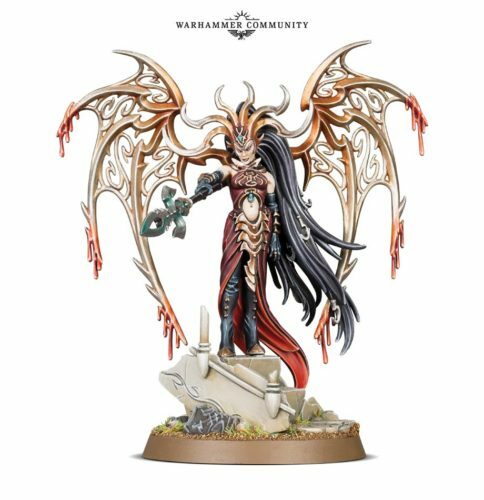 Amazing sculpts, I can't to see her built and painted up at a local store. Also want to mention, for the price you get both versions of her as Pictors mentioned above. That is an amazing price to get her in two complete models.